Week 12 was a very quiet week, with no major upsets at the top. As a result, there are few interesting movements to discuss in the MaxDiff Poll, as well as the CFP and AP Polls. 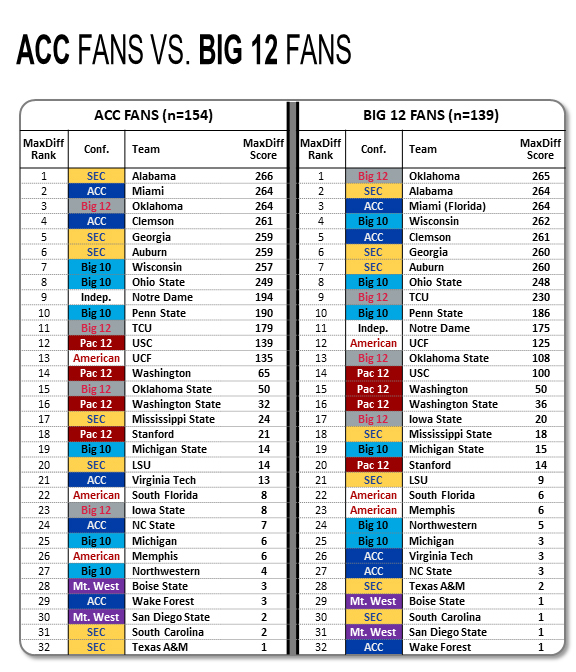 To keep things interesting, this week we compare the rankings of ACC and Big 12 fans. Unsurprisingly, Big 12 fans placed Oklahoma in the number one spot, while ACC fans placed Alabama in the top position. However, one surprising item is that even ACC fans placed Clemson below Oklahoma. Despite the Playoff Committee ranking Clemson above Oklahoma in every CFP Poll thus far, there is a growing body of evidence that fans in general believe Oklahoma to be the superior team. If you are new to this poll, or would like an overview of how the MaxDiff technique works, please see our post from Week 1.